Ch.13: Was ist dein Lieblingsessen? : What do you like to eat? Pretzels are a traditional German snack. Healthy eating - "Obst ist gesund." 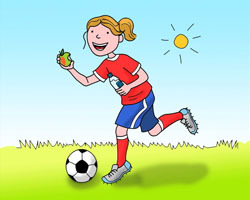 As in the UK, children in German schools learn about healthy-eating. This section introduces various common foods and drinks popular with German children. Pupils will learn how to say which foods and drinks they like or dislike, and whether they are healthy or unhealthy. Children can also find out about some traditional German foods - and even try some.